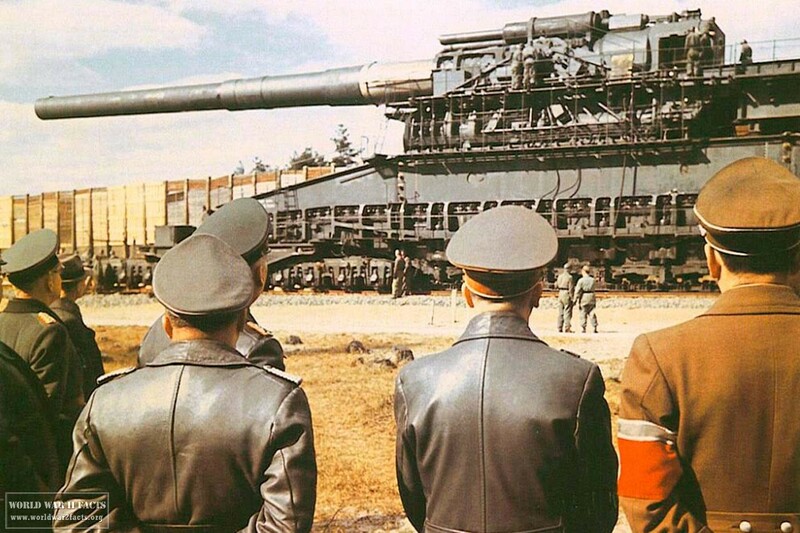 The Gustav Gun, (properly known as the Schwerer Gustav gun), was a siege gun developed in preparation for World War 2 and is the largest caliber rifled weapon to see combat in the history of artillery. The Gustav is also notable for firing the heaviest shell of any artillery piece. The only guns to exceed the Gustav in caliber are the British Mallet’s Mortar (36 inches/944mm) and the Fench Monster Mortar (36 French inches, 975 mm). The Germans possessed two Gustav guns with the second being named Dora. They were designed as railway siege guns with the primary purpose of destroying heavy fortifications such as those found at the French Maginot line. Since the weapons were not ready when the Wehrmacht outflanked the Maginot line during the Battle of France, Gustav was moved to the Eastern Front to be used in the siege of Sevastopol during Operation Barbarossa, Leningrad, and during the Warsaw uprising. 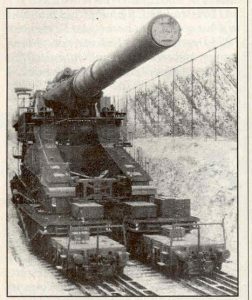 80 cm Gustav Railway Gun, date unknown. Gustav Gun Crew: 250 to assemble the gun in 3 days (54 hours), 2,500 to lay track and dig embankments. 2 German Flak battalions to protect the rail gun from Allied Air Attack. The German Army High Command (OKH) commissioned Krupp of Essen, Germany to destroy the fortifications located at the French Maginot Line in 1934. The requirements laid out were to create a gun capable of piercing one full meter of steel armor plate or seven meters of reinforced concrete beyond the range of French artillery. 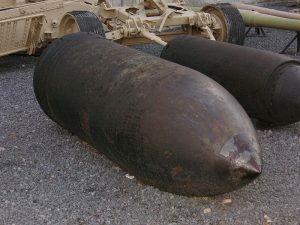 Dr. Eric Müller, a Krupp engineer, calculated that to meet the requirements of the OKH, it would take a shell with a caliber of approximately 80 cm, from a barrel 30 meters long, and weighing seven tons. Based on the required size of the weapon (a total weight of more than 1,000 tons), it would need to be supported on railway tracks to be mobile. The gun would only traverse in elevation with traversal being accomplished by moving the gun along curved sections of runway. At this point development stalled until Adolf Hitler visited Essen in March 1936 and asked about the feasibility of the Gustav gun. 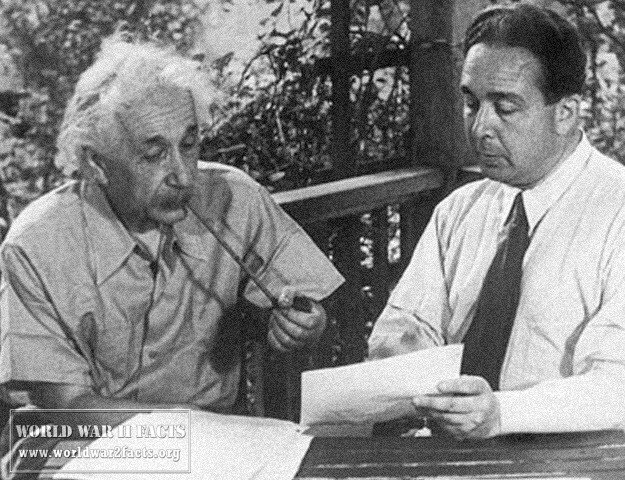 After this trip, design work began on the 80cm model with plans completed in 1936 and approved. Construction of the gun started in the summer of 1937 with a number of technical challenges faced during the forging of large pieces of steel. A test model was built in 1939 and successfully penetrated one meter of armor plating and seven feet of reinforced steel at the Hillersleben firing range. Formal acceptance trials of the gun were conducted at the Rügenwald Proving Ground with Hitler in attendance in the spring of 1941. 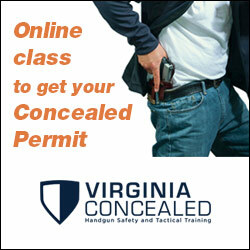 After the trials, Hitler directed the gun only be used at his discretion and two guns were ordered. The first round fired from the commissioned gun barrel occurred on September 10, 1941. For combat use, the gun was mounted on a special chassis with a total of 40 axles on the eight cars used to support the gun. The original Gustav Gun was provided to the German Army at no charge, but the second gun was seven million Reichsmark in World War 2 money. The Heavy Artillery Unit (E) 672 began its march to the Crimea area in February of 1942 taking the Schwerer Gustav gun with them. The train transporting the gun was 25 cars in length (1.5 km), and the gun arrived at the Perekop Isthmus in early March 1942 and stayed there until early April. The Germans built a special railway line to the Simferopol-Sevastopol railway 9.9 miles north of the target with four semi-circular tracks to allow the gun to be aimed at different targets. Outer tracks were then constructed to service the cranes required for the assembly of Gustav. 8 x shells fired at coastal guns at a range of 25,000 m.
6 x shells fired at Fort Stalin. 7 x shells fired at Fort Molotov..
9 x shells at the "White Cliff" aka "Ammunition Mountain" which was an undersea ammunition magazine in Severnaya ("Northern") Bay. The magazine was located 30 meters under the sea with 10 meters of concrete protection. After the 9th shell, the magazine was destroyed and even one of the ships in the bay were sunk. 5 x shells fired at Fort Siberia. 5 x shells fired Fort Maxim Gorki and its coastal battery. At the conclusion of the siege of Sevastopol on July 4, 1942, Gustav had fired a total of 48 rounds and the original barrel was worn out (250 rounds were fired during R&D). The spare barrel was installed at this point with the worn-out one sent to the factory for refurbishment. At this point, the German army had the Gustav gun dismantled and moved to the northern section of the Eastern Front of the war near Leningrad. It was positioned about 30 km from the city in close proximity of the railway station, Taizy. Although the gun was operational, the attack on Leningrad was cancelled and it spent the winter in this location. After the winter, the Gustav was moved to Germany to be refurbished. 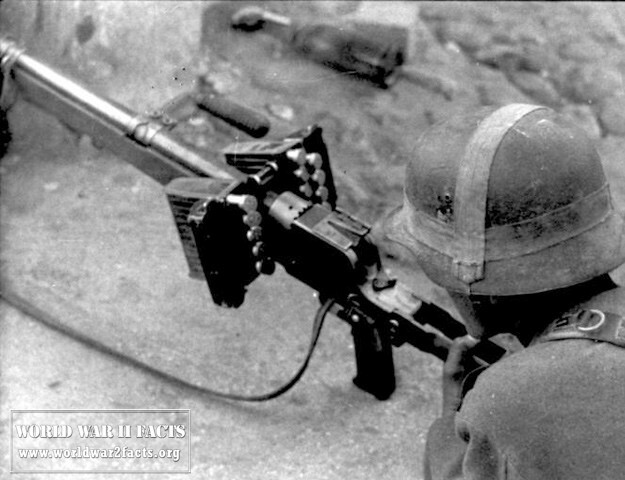 Although some have claimed to the contrary, the gun was not used during the Warsaw uprising. To prevent Allied capture of the gun, it was destroyed at some point prior to April 22, 1945 when it was discovered in the forest approximately 9.3 miles north of Auerbach. A shell for the Dora gun gun (without the sharp ballistic cap) found after World War II at the former German firing range near Darłowo, on exhibition in the Polish Army museum in Warsaw. its emplacement approximately 15 km west of the cit in August of 1942, and ready to fire on September 13th, it was withdrawn as encirclement by the Red Army threatened. The Germans took Dora with them on the retreat and Dora was broken up prior to the end of the war. The American Army discovered the remnants of the weapon after the Schwerer Gustav had been discovered. There are no wartime engagements attributed to Dora. The next generation of the Gustav gun was the Langer Gustav. It had a long cannon with a 52 centimeter caliber and 43 meter barrel. 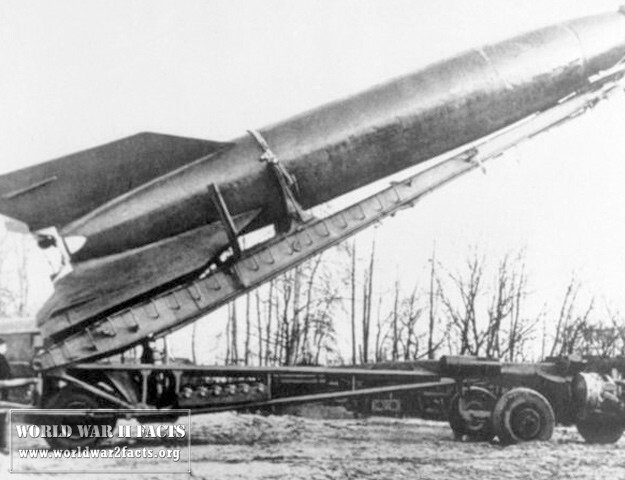 The intended purpose of the Langer Gustav was to fire extremely long range rocket projectiles that weighed 680 kg for a total range of 190 km. This would give it the range to hit London. After being damaged by the RAF raids on Essen, the gun was never completed. The Landkreuzer P. 1500 Monster was designed to be a self-propelled platform for a shoot 80 cm KE gun along with 2 x 15 cm sFH 18 heavy howitzers, and a number of MG 151 autocannons normally used on combat aircraft. Eventually the German Army determined the gun was not practical and cancelled the project in 1943. If the weapon was built, it would have qualified as the largest tank ever built.